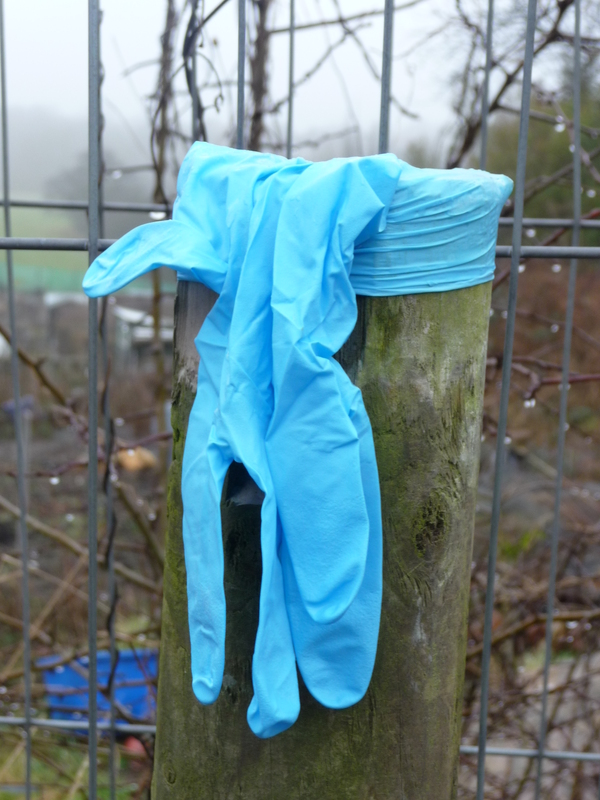 So, many moons ago I wrote that I was treading the streets of Fulwood…..and sometimes the paths of Cumbria, in a bid to lose weight so as to facilitate having a baby. How the tables have turned – or have they? Now, having had a baby, I am, once again, having to realise that I need to do some exercise. The last walk I did when in this frame of mind, proffered forth the highest number of losses in any one walk ever….and I was absolutely sure I’d already blogged them…but I’ll be darned if I can find that blog…so here goes, with an apology for repetition. The more I look at these pics, the more I am sure I have already blogged them but I can’t find them so I must be going mad – one of the truer statements relating to becoming a mother – I never really acknowledged how true it was when people referred to baby brain but it’s really quite alarming. I can’t recall conversations I’ve had two minutes ago! We went over to St Annes and walked along the prom, past the old site of the open air baths and to the pier. They are currently restoring the end of the pier by the looks of it, and there’s a lovely new cafe at the end. I say lovely, we didn’t go in, but it looks so quaint and welcoming……bit less full-on than the arcade which you have to plough through before getting back into the open air. I’m a sucker for the British seaside, so piers, donkeys and wind breaks evoke real joy in my heart…..noisy arcades and the constant allure of chips, perhaps not as much! It was possibly the first bright, sunny afternoon this year that we’ve managed to enjoy a bit of the outdoors…..more of that, please. 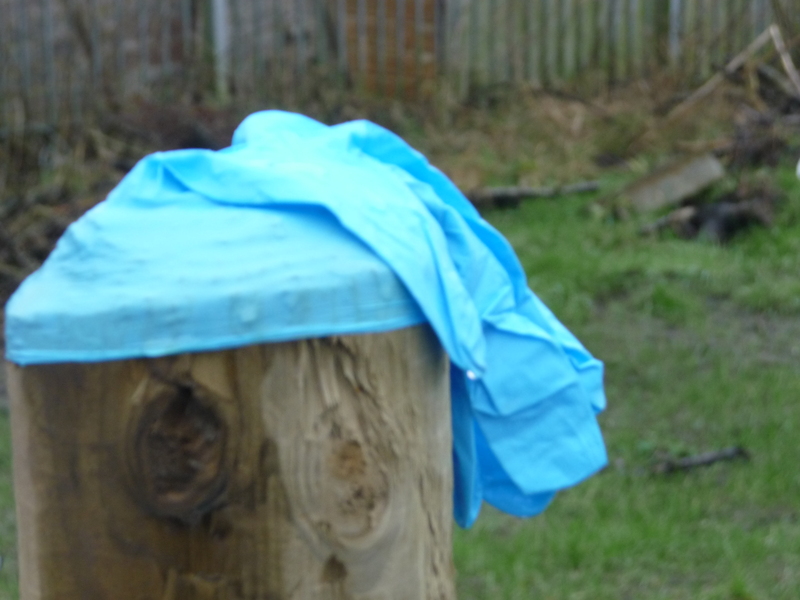 Anyway…..in a bid to keep it fresh, I’ll shut up, suffice to say the battle of the bulge is back-on! 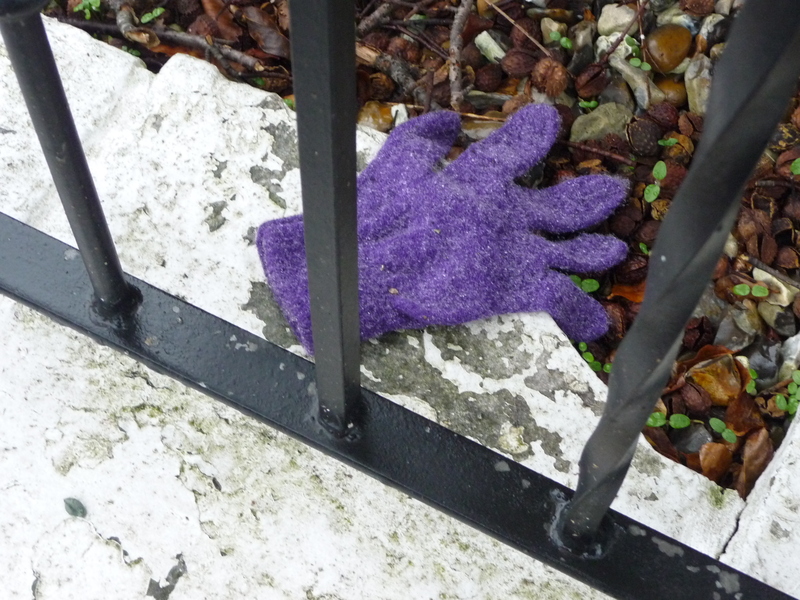 It’s funny how so many gloves find their way on to the railings of a church. 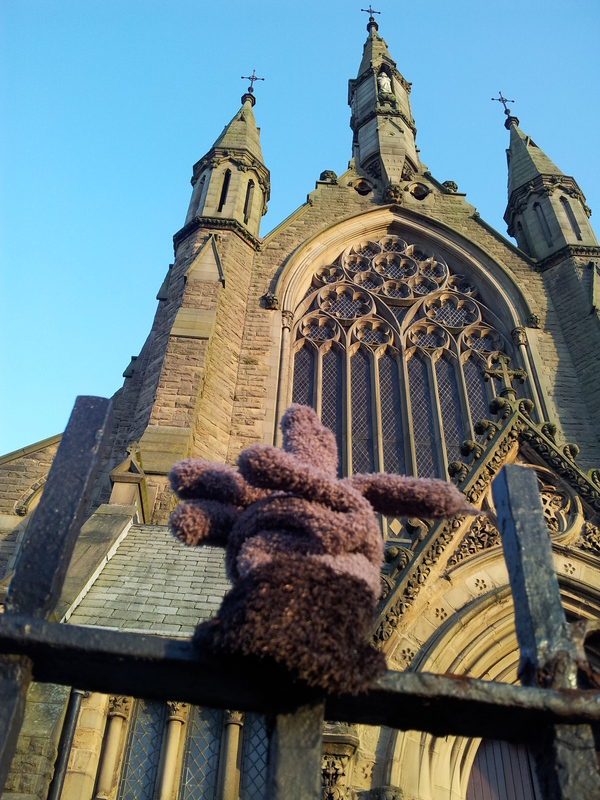 Funnier still how the finders, or maybe the elements, point a finger towards the spire…a kind of godly loss? 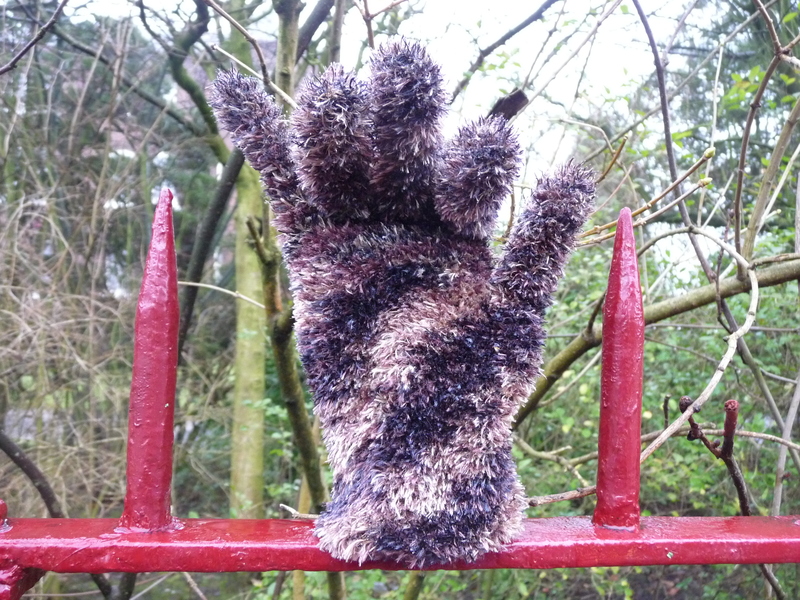 This fluffy beauty was on the railings outside English Martyrs Church, just outside town, spotted as we took a post Christmas walk up to the Asia Continental Supermarket on Sedgewick Street. I’ve never been inside the church but just googled them to see if they had a site – it looks very jolly indeed. Having been brought up CofE, in truth, I’ve been inside very few UK Catholic churches and I’m always astounded by how ornate they are by comparison to their protestant counterparts. Church decor is something which always makes me question the graven images commandment whenever I’m inside one. St Walburge’s, also in Preston, is a fine example of fabulous church decor, with its splendid stained glass windows and minstrels gallery, the second highest spire in the country and beautiful stone. I’ve no idea if you can gain access for a peek, sadly its parish is all but non existent and I know, years ago, there was an urgent sense of it having to be saved from disappearing as a church per se but if you can get inside, revel in it. While I find church interiors often quite beautiful in their over the top design, from a spiritual perspective, there can be none more moving than St Martin’s Church in Martindale, in Cumbria. Its serene simplicity, lack of embellishment and ancient design make it an idyllic place to sit quietly and contemplate life’s greater questions. All that said, as a lapsed church-goer (understatement), for many, many years I ceased going inside churches, as a tourist, after being in Crete one Easter. We took an excursion on Good Friday to a village church, where the presence of so many tourists made it impossible for actual worshippers to attend their own service inside their own local church. I was ashamed to be there, merely to gawp at the interior,when people were trying to get in for more legitimate reasons on the most important day of their religious year. So I stopped going inside. I missed the Dome of the Rock when I was in Jerusalem, have missed countless divine settings in Europe and chosen to stand outside instead. But I’m going back inside more of them, just choosing my timings and being more considerate, I hope. On a lighter note, I feel compelled to discuss the Asia Continental – I have to say I love it, although spend far too much on sacks of spices which will go off long before they are used. It’s a wonderful place to find most of your foreign goodies, not just Asian cuisine. There’s also a really good fresh fruit and veg section with a good range of everything from the pedestrian to the exotic, but best of all, for us, if you’re someone who makes jams or chutneys, you can buy stuff by the crate! Perfect for when you’re whipping up a batch of Moro’s harissa or Mrs Balbir Singh’s mango chutney – I think it’s her recipe we use (?)! 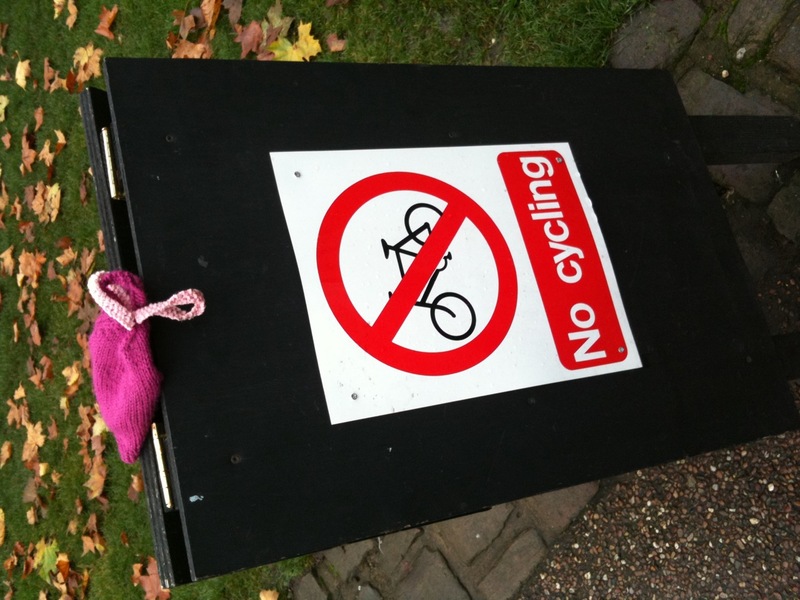 It’s been an age – I forget how long, since I last wrote a lost blog. A lot has happened and, as Booker T would say, Time is Tight. Yippee and hooray and everything else in life pales. Cheesy but true. This morning this photo was posted by Justin Grammer on his Facebook page with a nod to the Lost Socks Laundromat….so I HAD to write. Having never been to Kendal Castle I can’t comment on its visitor attractiveness but I’m guessing it’s a ruin and stands on a small hillock surrounded by the breathtaking Cumbrian hills. 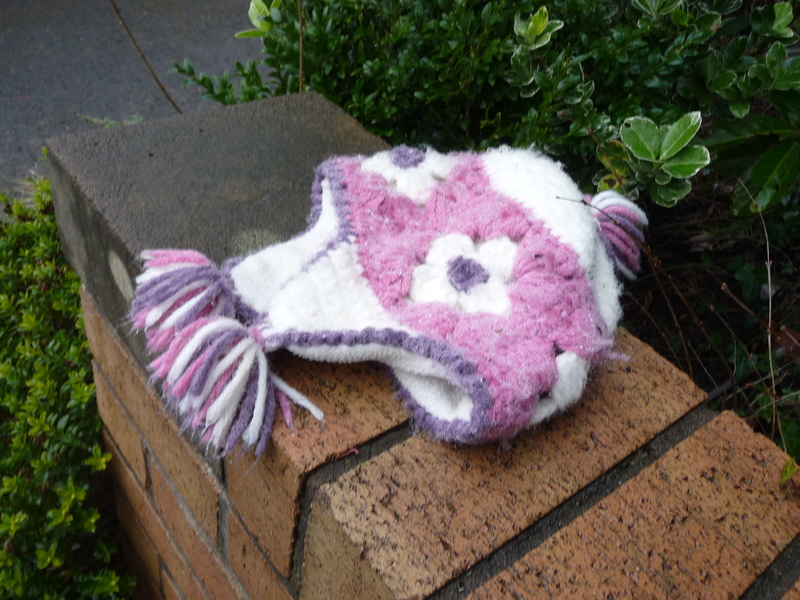 And this is where the hat resides. Sadly my lasting memory of Kendal Calling – the title of this piece, was when the music festival was still sited just off the Kendal bypass in a farmer’s field. It was a dreadful weekend weatherwise, very sadly indeed 2 people died from dodgy drugs and with them died my inclination towards ever attending another music festival. I am told, however, that its new location at Lowther makes it a much more appealing past time. The line up gets bigger and better with every year and were it not for our dear, sweet, little boy, I might have given it a whirl this summer. Kendal, itself, is a lovely place, made all the more enjoyable last year when a group of otters decided to take up residence on the river, slap bang in the centre of the town. Give it a whirl. It’s got some great eateries and the number of locally produced gastronomic delights make it a must go for any foodie! I just wish I could still find Kendalicious Cordials but fear they may no longer be around. Check out their food festival in March. Lost with the Lord of the Rings! I’m not a fan myself. I’ve read the first page countless times, I think I even made it to page two once. I set it down as the films came out but having nobody with whom to watch them at the cinema and, having insufficient confidence to go alone, I waited until they hit the small screen or borrowed DVDs. It was no better then. I could see from the outset that these were films which needed to be watched on a large screen. Having borrowed the first one off my then boss, @otoolealexandra, I marched into work the following day admitting my defeat and noted that the films were long enough without having to pause them intermittently for Monday night double episodes of Corrie. Alex, bless her, was apoplectic and close to issuing my first written warning. Their setting and inspiration, however, could not be nearer my heart. There is an arrogance within that rejoices in the fact that more observers than not note that Tolkien was living in the Ribble Valley at the time the books were written. 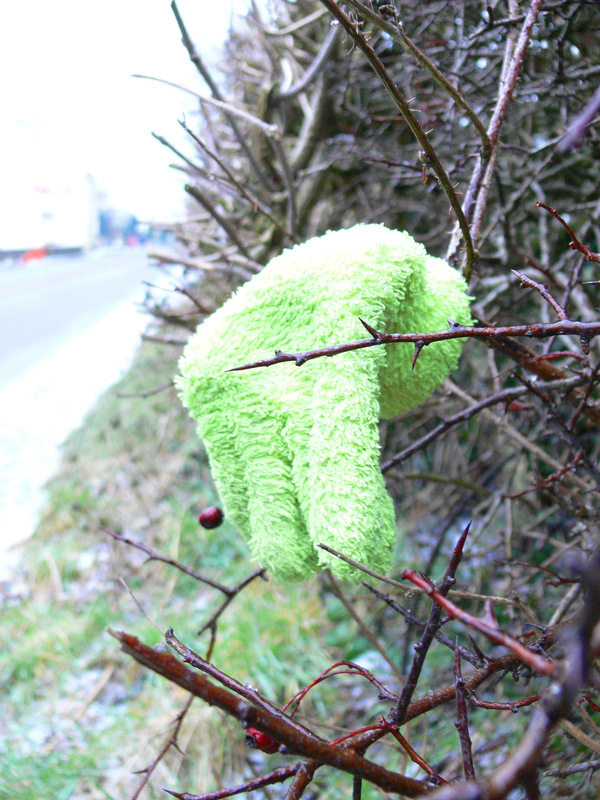 So this little, lime green, fluffy lost glove was right in the heart of Middle Earth (for all I know this reference might be a Star Trek one, I know I’ve heard folk mention it….but, to be fair, I’m not a fan of either, yet their respected fanbases seem to attract the same people). My name is Inigo Mantoya, you killed my father, PREPARE TO DIE! The quotes come thick and fast from “Never start a land war in Asia” to the best, “Hello, my name is Inigo Montoya, you killed my father, prepare to die”. Why has Mandy Patinkin not had more huge roles….he is fabulous. 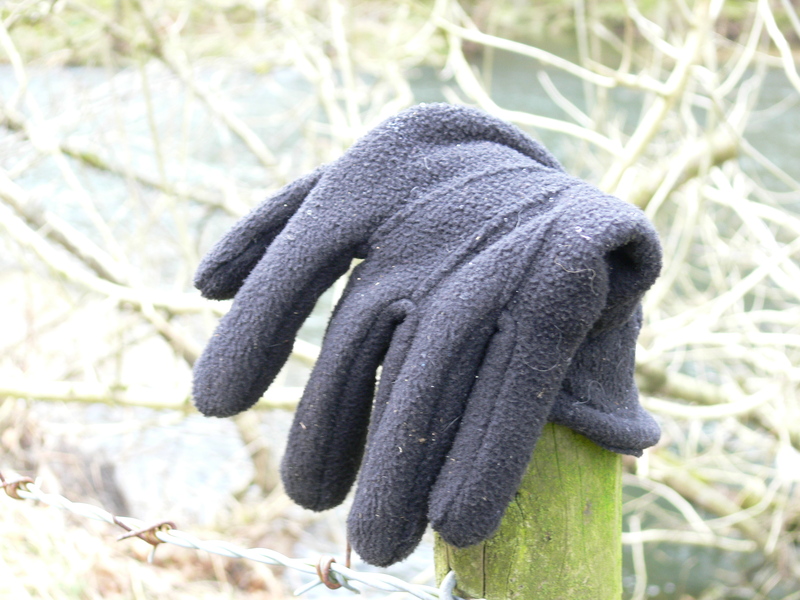 Anyway to return to the glove….it was not owned by the six fingered man..
…..there is no concealed thumb! And the walk, whence this bright loss was spotted…..well that took place last weekend, when it snowed throughout, when stopping for sandwiches seemed like a good idea but resulted in my fearing I’d never feel my fingers again. 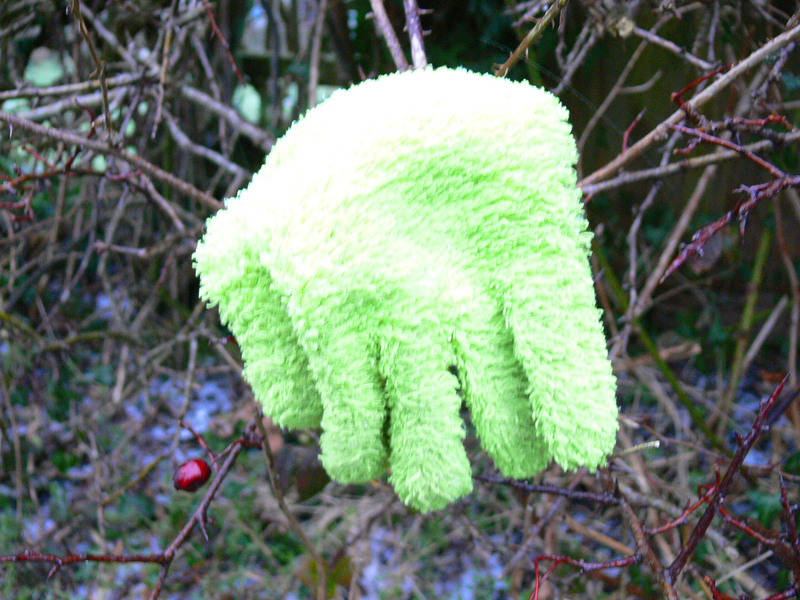 Note to self…buy mittens, gloves don’t cut it. It was a walk which started in a layby beyond Hurst Green, backed up on itself and took us through the grounds of Stonyhurst (setting for Three Men and a Little Lady school scene) and up on to Longridge Fell. It would be such a pretty walk without doubt in the Spring and Summer, but the view was marred by low lying snow clouds. From Stonyhurst we walked up Kemple End and through the woodland on Longridge Fell, dropping back through Green Thorn, Deer House Wood, over Sandy Bridge and back into Hurst Green. 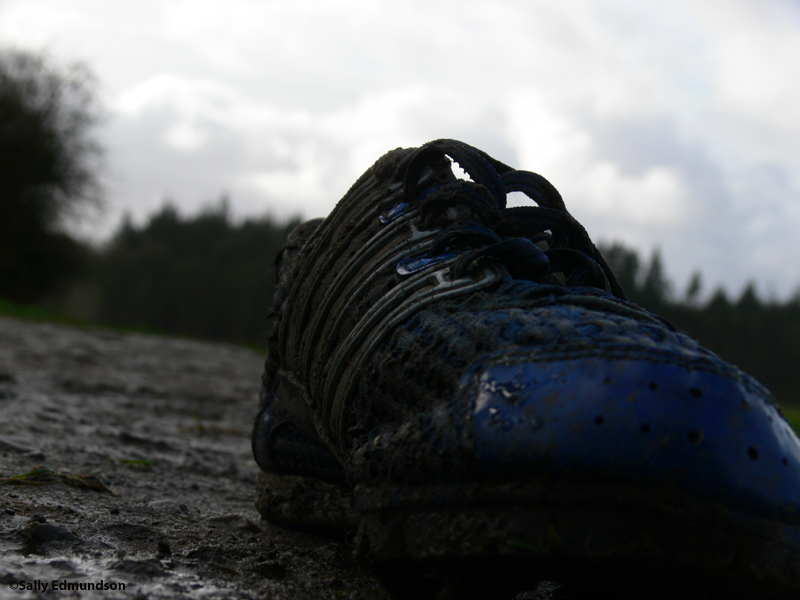 7 miles, 4 hours. Fabulous. Lost in a Yorkshire getaway! My friend Kath went away just before Christmas, with a few friends, for a long weekend in York although how she managed to get anything done is beyond me. 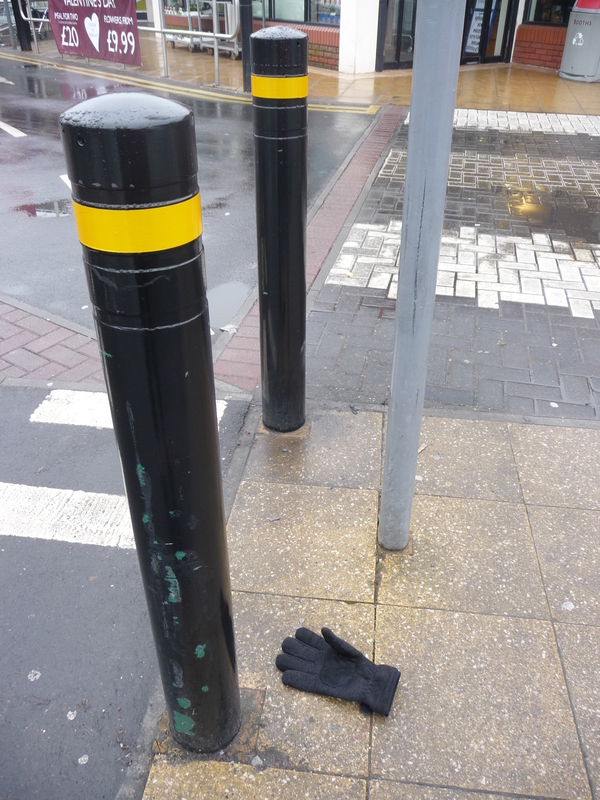 York, it would seem, is littered with the lost. 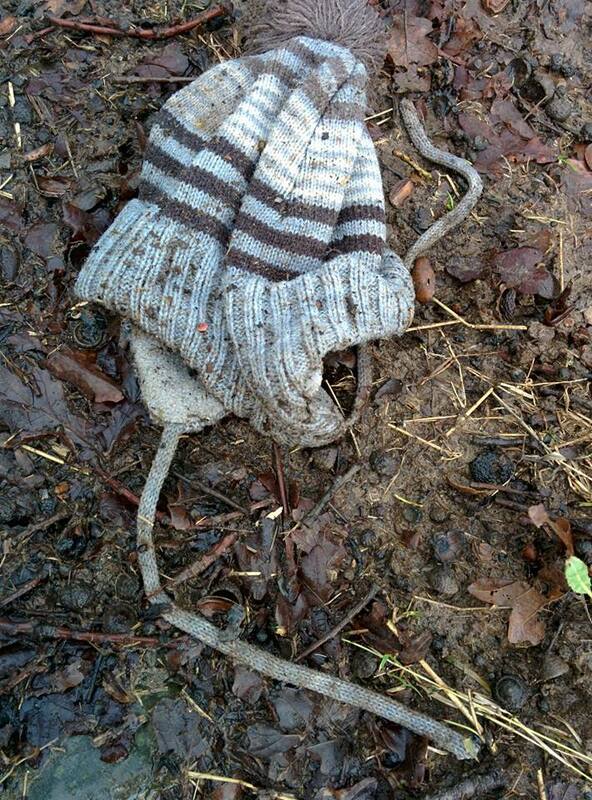 I love it when folk place lost stuff in obvious places so that the owner will see it. 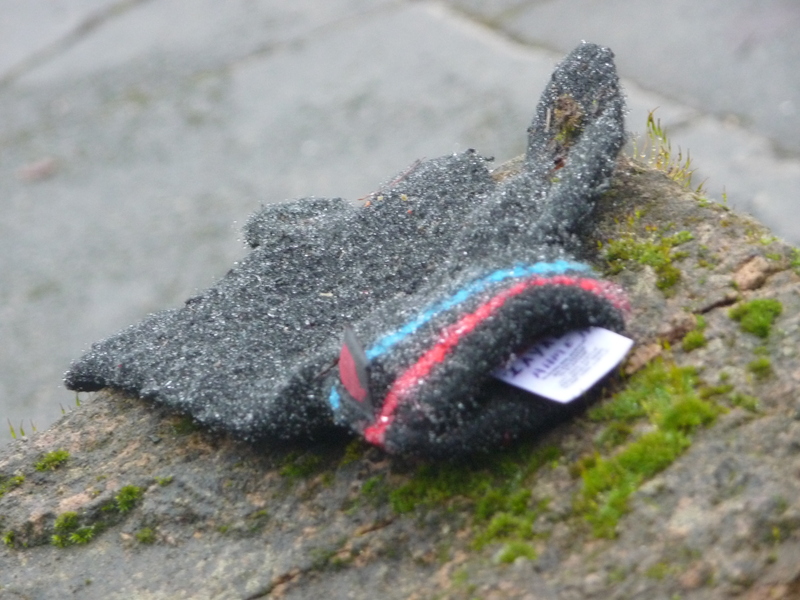 That said, a reader of the lost socks laundromat messaged me via Facebook recently to tell me she collects lost stuff, so I consider myself fortunate to get any shots at all. Her approach is much worthier! I just leave the detritus where I see it! Another fan favourited the lost trainer from my last post on my flickrstream! FAB. I’ve not been to York for a long time. I think the last time was to negotiate a reciprocal arrangement with Best Western to promote the last company for whom I worked in exchange for using their venues where we could. It seemed like a great idea on paper but I seem to recall our getting few, if any, referrals. My only other recollection of time out in York was it taking far less time to drive there than I’d ever imagined only to then spend an eternity trying to find somewhere to park….am guessing the train is the answer! Ah yes our first walk of the New Year and I had managed to lose the trail within literally 100 yards of the car park…..what hope? 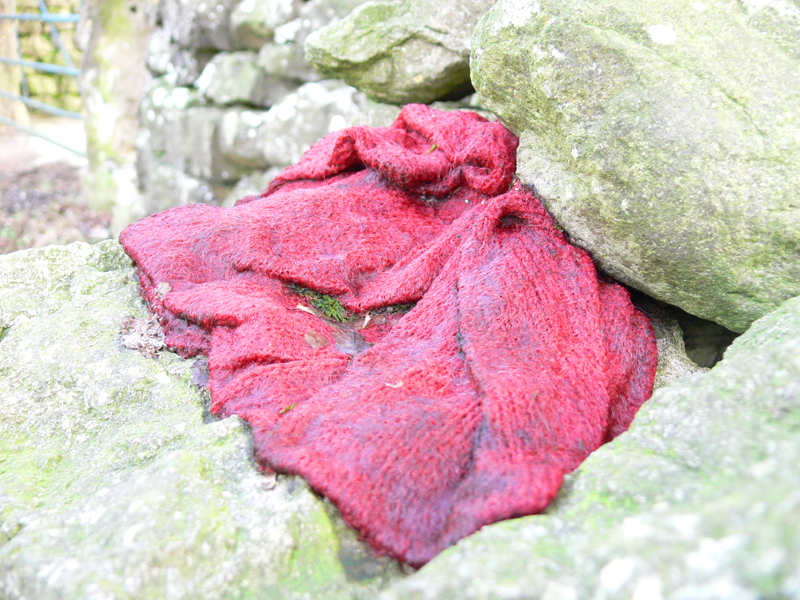 I handed over to Gillian, who set us right, allowing me to indulge in the pursuit of the lost. 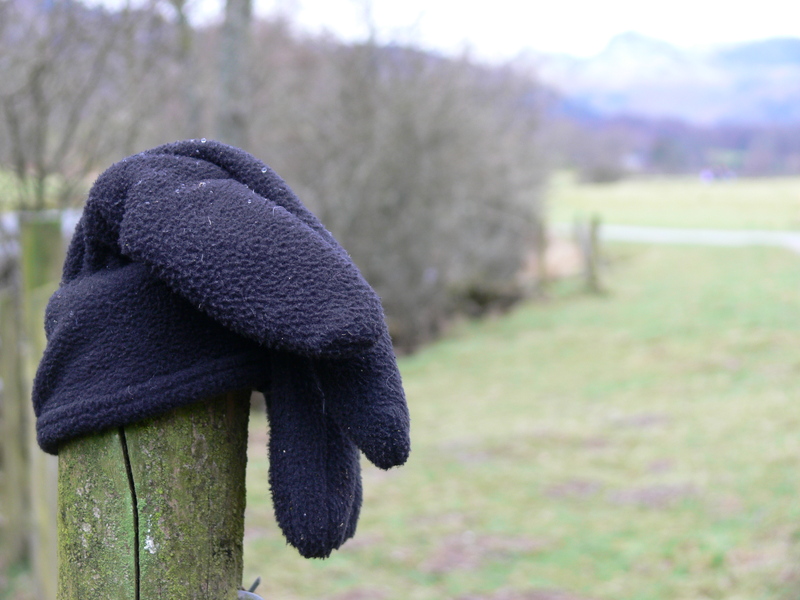 Leftover from the fell run? How do you lose one trainer? Our route for the day was a walk I’d chosen from one of my favourite walking books and was a 7 mile, 4 hour circular walk around Cartmel, taking in Hampsfield Fell as an optional offshoot. 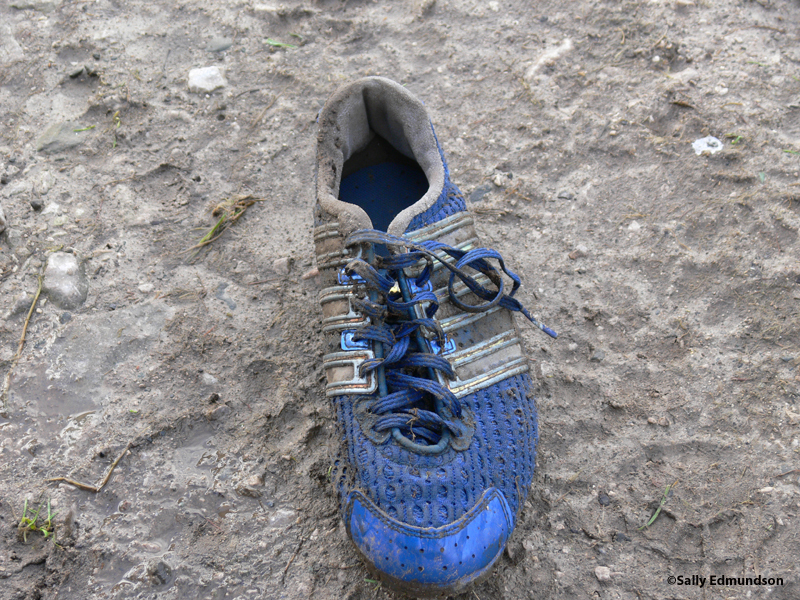 The great guy in the tourist info office, on the village car park, told us there’d been a fell run the day before with not a single parking space available from about 11am onwards…so I wonder was this rather new looking trainer belonging to a runner? As you know I’m not really one to veer away from clothing or footwear but the dummy seemed so photogenic I couldn’t resist. 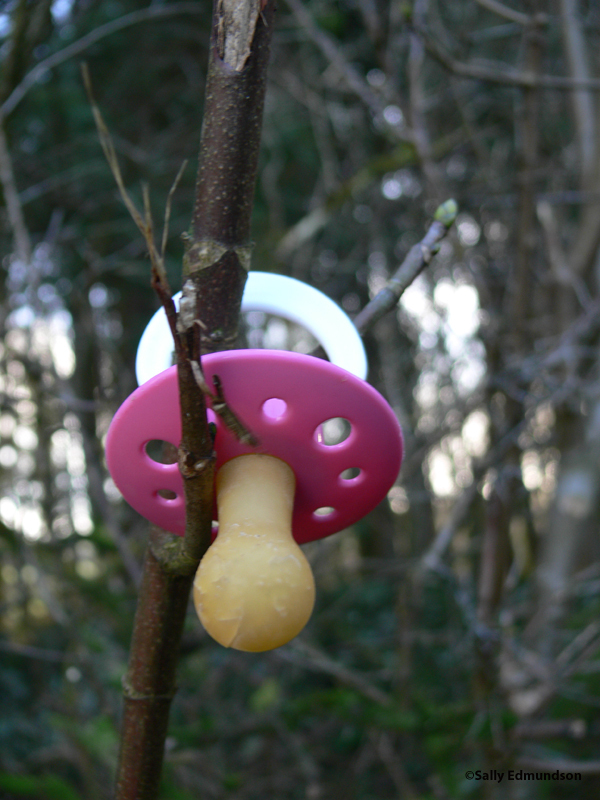 Seriously though, I know someone mounted it on a branch so that it could be easily spotted but am inclined to think if I’d dropped my baby’s dummy, I’d not want it back after it’d been dropped in God knows what muck half way up a country path! The walk saw us through woods, wandering on farmland over fields, a bit of road walking, many stiles and finally up Hampsfield Fell whose summit is complete with a stone hospice…….when Gillian read this aloud I’d seriously imagined a rest home up a hill……but no, it’s a stone tower…no idea what its purpose, but given the wind it was a perilous climb to the top where I literally sank to my knees for fear of being swept off. We were home just in time for the heavens to open and refuge to be sought in the fab King’s Arms. Can I recommend, please? Wonderful, attentive staff, good ale and food at the bargainacious offer of £25 per couple YES per couple for a 3 course dinner as part of the Sunday Supper Club. I had smoked salmon, a roast beef dinner and then banana bread, ice cream and toffee sauce…….all for £12.50. And it was all delicious. I’ve not enjoyed such value for money in ages. Sad that we didn’t have time to wander round the priory but I suspect I’ll be back in Cartmel sooner rather than later when I hope to check out L’Enclume! Hmm I wonder how I’ll find the value for money there….watch this space. 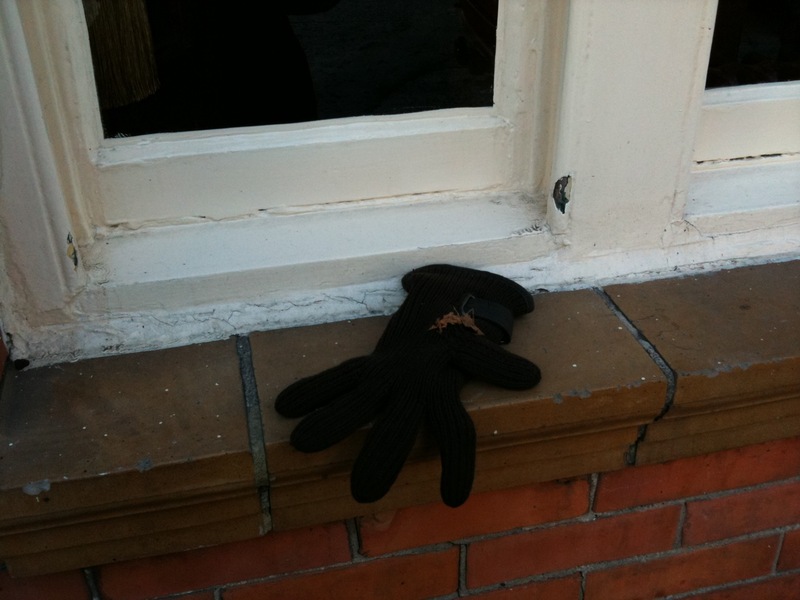 Lost Gloves – anyone know where this is? Where the hell was this? And when? 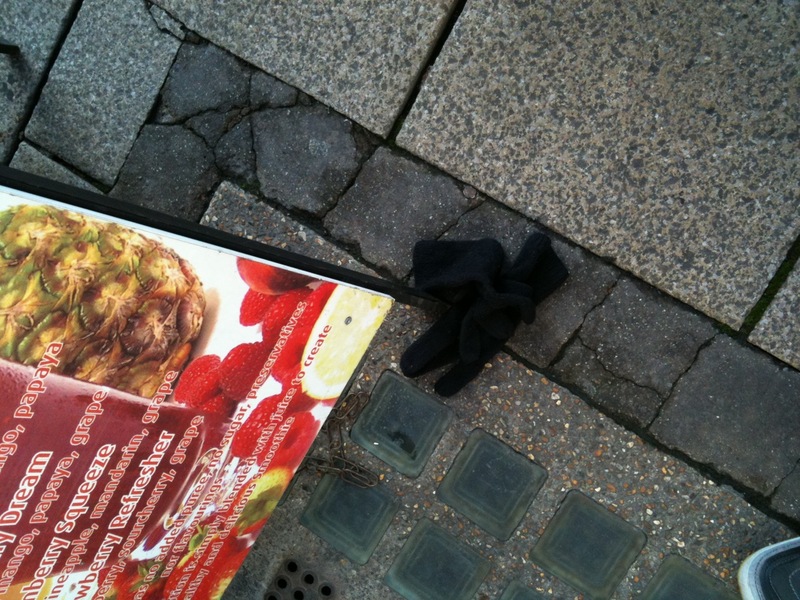 I made a concerted effort, mentally, earlier this week to start maintaining the lost socks blog as I’ve been more than remiss these past few months. So I find it totally annoying to present these photographs and have absolutely no recollection where they were taken. If any of my walking friends can recall (fat chance) then please do enlighten me. My appalling memory has started to cause me concern. I’ve always had the classic elephant’s memory – I never forget. Only yesterday I had lunch with a former colleague of 14 years ago and mentioned that whenever I see Errol Brown I think of her, similarly George Michael…she’d been mad about both in her youth and I vividly recall her describing her utter disbelief the day she found out George was gay! She was amazed by my memory. Yet, in my defence, I have to say that while I can name probably all 120 girls in my year at school in 1980, I can’t remember the name of someone to whom I was introduced yesterday…and, worse still, no disrespect girls, but that person I met yesterday might be someone who would hire me tomorrow! Is it just me or does everyone hit 40 and life thereafter is just not the same? You forget everything and have to make lists, ALL the time. You can’t shift half a stone yet at 39 you drop could drop it in a week.